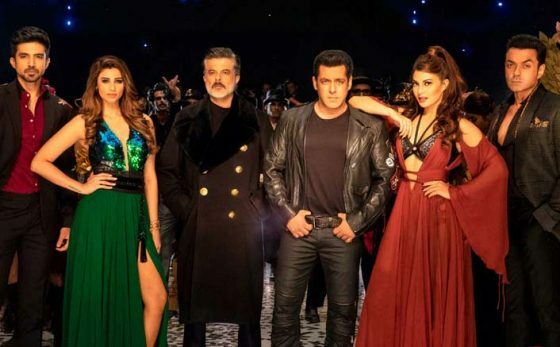 Home Music Review Race 3 Music Review: WORST Salman Khan Album Of This Decade! Music Director/s: Meet Bros, Vishal Mishra, Jam8, Tushar Joshi, Vicky-Hardik, Gurinder Seagal, Kiran Kamath. Album of a Salman Khan film comes with a burden of not just chartbusters but also songs that will reformulate the aura of Salman Khan in those songs. Half of the album was released before the album launch making half the impact. Every Salman album has a song designed just for him. However good Sultan & Tiger Zinda Hai albums were, Baby Ko Bass & Swag Se Swagat will be the first songs that will come to your mind on hearing the names of these films. Let’s dive into the music ofRace 3 and hunt if we get that one definitive Salman song. Those who are new here, my reviewing style of a music album is a bit different from others. I don’t listen to the entire album and write the review. Instead, I listen to each song individually and write about it. So, please don’t judge me on the whole, judge me paragraph-wise. The album starts with a probable chartbuster & it delivers what it promised. Deep Money’s Naina Da Nasha gets Bollywood’ized but retains what’s best from the original. The tune is addictive, lyrics by Kumaar are hummable & overall a song that gets instantly grabbed by the DJs in the clubs. This comes close being that ‘Salman’ song but let’s see what we’ve more in store for us. “Arey re…” – these are the first words I uttered after listening to this imbalanced song. The music is good, tune is amazing but lyrics which are written by Bhai himself don’t justify the theme. The intent behind writing the lyrics was good but somehow the usage of Hinglish ruins the mood. Just imagine how the song would’ve sound with these lyrics: “Ek baar yaara, khudaar hoke apne liye jeeo na…” – Yes, they are still half-baked but better than before. Plus roping in Iulia opposite Atif Aslam? Let’s move to the next song. The only good thing about this song is its retained portions! Allah Duhai Hai is Race & Race is Allah Duhai Hai – what makers did in Race 2 was a job well done but multiple cooks have spoiled the main course in this one. It’s a total drag with a very uninteresting rap portion forcefully added to it. When I heard the title of the track, saw who’s singing it, I was pretty pumped up for this song (Yes, despite knowing Iulia will crooning the female portion). But, even this song don’t live up to the expectations. This breaks the indestructible record of Salman Khan & Mika Singh – Jumme Ki Raat (Mika & Salman), Dhinka Chika (Ready), Aaj Ki Party (Bajrangi Bhaijaan), Desi Beat (Bodyguard). This song reminds me of our traditional saying, “Jiska kaam usi ko saaje, aur kare toh buddhu baaje.” It’s okay to try new things & I’m not against it but please don’t try things that can harm others. Worst song of the album till now, yes even Selfish was better – thanks to Atif’s voice & the soothing tune. Salman gives us a double dose (of sedatives) with song as he writes & sings it. Wait, what? Isn’t this the same song we all have got on Whatsapp compiled with the pictures of heartbroken couples? At first, I was like how can a film of this genre can have this song but then I heard to Selfish & I Found Love again; now this song makes totally sense to me. The song is good, Shivai Vyas has modified the lyrics & it will sound well as a standalone song but it’s hard to imagine how the makers will fit this song in the film. Best song of the album for me! If this was somewhere mashed up with the title song, it would have been an altogether different story. The rap and music perfectly go with the theme of the film & this is how it should have been done with rest of the songs. What a refreshing melody wrapping up under three minutes. There are three more songs in the solo and unplugged version of Selfish as if one was not enough? There’s also a mash-up which is like a dish you get when you mix up some bland ingredients. No song matches up the aura of Salman Khan & yes with a heavy heart, I have to say that this is the worst album of him this decade.